Implantation mycoses include a heterogeneous group of fungal diseases that develop at the site of transcutaneous trauma. They are also known as “subcutaneous mycoses,” but this term seems to be imprecise because some of implantation mycoses may also involve muscles, fascia, cartilage, and bones, beyond the skin and the subcutaneous tissues. These diseases are a frequent health problem in Latin American countries and other tropical and subtropical areas of the world. 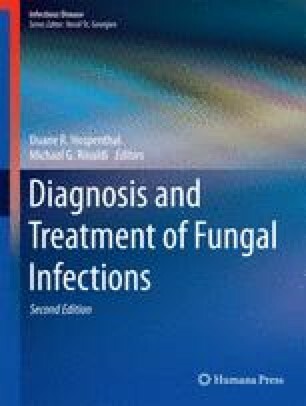 Although these infections rarely cause disseminated or invasive disease, they have an important impact on public health, may be difficult to control, and often recur.The implantation mycoses covered in this chapter include chromoblastomycoses, eumycetoma, lacaziosis, and entomophthoramycoses. Errol Reiss H, Shadomy HJ and Marshall Lyon III: Mycoses of implantation: Fundamental Medical Mycology, edited by John Wiley & Sons, Inc, 2012. Wiley-Blackwell, 475. La Hoz RM and & Baddley JW. Subcutaneous Fungal Infections Curr Infect Dis Rep 2012; published on line 19 July 2012. Queiroz-Telles F, Nucci M, Colombo AL, et al. : Mycoses of implantation in Latin America: an overview of epidemiology, clinical manifestations, diagnosis and treatment Med Mycol 2011;49:225–236. McGinnis MR. Chromoblastomycosis and phaeohyphomycosis: new concepts, diagnosis, and mycology. J Am Acad Dermatol 1983;8:1–16. Queiroz-Telles F and Santos DW. Challenges in the therapy of chromoblastomycosis. Mycopathologia. 2013;175:477–88. Ahmed, A. O., W. van Leeuwen, A. Fahal, W. van de Sande, H. Verbrugh, and A. van Belkum. 2004. Mycetoma caused by Madurella mycetomatis: a neglected infectious burden. Lancet Infect. Dis. 4:566–574. Cortez KJ, Roilides E, Queiroz-Telles F et al. Infections caused by Scedosporium Clin Microbiol Rev 2008;157–197. Welsh O, Vera-Cabrera L, Salinas-Carmona MC. Mycetoma. Clin Dermatol. 2007;25(2):195–202. Brito AC, Quaresma JAS. Lacaziosis (Jorge Lobo’s disease): review and update. An Bras Dermatol. 2007;82(5):461–74. Taborda PR, Taborda VA, McGinnis R. Lacazia loboi gen. nov., com. nov., the etiologic agent of lobomycosis. J Clin Micrbiol. 1999;2031–3. Kwon-Chung KJ. Taxonomy of Fungi Causing Mucormycosis and Entomophthoramycosis (Zygomycosis) and Nomenclature of the Disease: Molecular Mycologic Perspectives. Clin Infect Dis. 2012 February 1; 54(Suppl 1): S8–S15. Roden, M.M, Zaoutis, TE, Buchanan, Knudsen, TA, Sarkisova, T.A, Schaufele, R.L, Sein, M, Sein, T, Chiou C.C, Chu, J.H, Kontoyiannis, D.P, Walsh, T.J. Epidemiology and outcome of zygomicosis: a Review of 929 reported Cases. Clinical Infectious Disease. 2005. 41: 634–53.